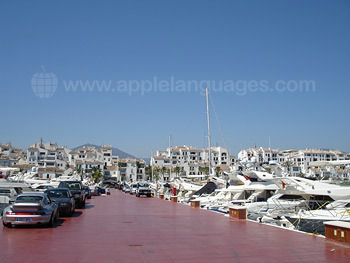 Marbella, which enjoys an average of 320 days of sunshine per year, is an excellent location to learn Spanish on a study-abroad program. Boasting 17 miles of sandy beaches, a wealth of history, and a vibrant nightlife, it’s more than just a resort. Like most cities in Spain it retains evidence of its mixed cultural heritage, such as the 10th-century Moorish castle and city walls. Its charming Old Town, or Casco Viejo, gives a sense of traditional Spanish life – especially worth a visit is the Plaza de Naranjos, with its pretty chapel and surrounding 16th-century buildings. Particularly renowned for its golf courses, visitors can enjoy a few rounds on one of the city’s 50 greens, all within easy access of the centre. Down by the sea on Avenida del Mar, you can find a selection of sculptures by the infamous Salvador Dalí and local artist Eduardo Soriano. This is best followed by a stroll along the 6 km seaside promenade, lined with palm trees and dotted with shops and outdoor eateries. Marbella is also home to a 4-mile stretch of luxurious villas, nicknamed the Golden Mile; famous residents include Sean Connery, Lord Alan Sugar, Antonio Banderas, and Simon Cowell – perhaps you’ll run into a celebrity or two during your language experience! 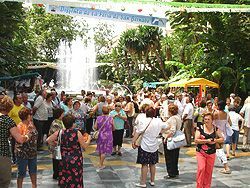 The city also hosts a packed calendar of festivals and cultural events, such as the International Film Festival, the annual Reggae Festival, and the Feria de San Bernabe summer fair, which takes place during the second week of June. By day, bars and restaurants set up shop on the streets; by night, the city comes alive with music, fairgrounds, and dancing. 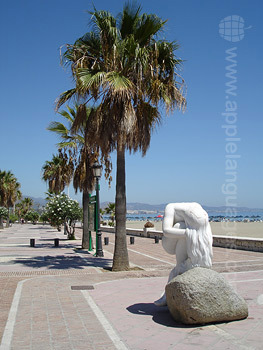 Our Spanish school in Marbella is located on a lovely tree-lined avenue just 5 minutes’ walk from the beach. At just a short walk from some of Marbella’s main parks, it’s also ideally located for some afternoon studying under the sun. The school is exceptionally well equipped, with 17 classrooms (3 of which are outside! ), each with audio-visual facilities. Other amenities include a beautiful sun terrace, a reading room, a large common room with vending machines serving drinks and snacks, and an Internet café, with 7 computers and free Internet access. The building is air-conditioned throughout and close to public transport links, meaning students can easily get around and see more of the area once their classes have finished. Nearby attractions include the sand sculptures at Escultura de Arena, the Paseo Maritimo promenade, and the Bonsai Museum with its traditional Japanese gardens. The historic Old Town is just a 10-minute walk away. You can learn Spanish in Marbella on an Intensive course of 20 lessons per week or a Super-Intensive course of 25 or 30 lessons per week. The 25-lesson programme includes 20 Spanish classes alongside 5 culture and conversation workshops per week; the 30-lesson programme adds 5 semi-private classes per week onto this course package. If you prefer to study alone or have particular areas of weakness or interest that you’d like to focus on – such as medical or legal Spanish – a private programme is the one for you. Students travelling in pairs can take advantage of the school’s semi-private lesson packages and learn together with a single tutor. You can also combine your group lessons with private tuition on an Intensive + Private programme, a great way to get the best of both types of class. If you’re hoping to sit a DELE or SIELE exam so that you can study at a Spanish university or work in a Spanish-speaking country, the school can offer a specialised 2-week exam preparation course. Tutors are trained in the most up-to-date methods to help students succeed – in fact, this course boasts a pass-rate of 95%! Our school also runs activity-based courses, including a Spanish & Flamenco programme – with 20 Spanish lessons and 8 Flamenco lessons per week – Spanish & Golf, or Spanish & Tennis, which each include 20 Spanish lessons and 5 hours of your chosen sport per week. Students can stay in shared apartments or with a local host family during their stay. Homestay lodging is highly recommended as it provides real insight into authentic Spanish homelife, allows you to practice the skills learned in class with local native speakers, and helps to maintain your immersion in the language – which is the best way to learn! Rooms are offered on half-board or full-board basis, and hosts’ homes are a maximum of 15 minutes’ travel from the school. Dietary requirements can be accommodated – please contact us for more details about this. Shared apartments provide the opportunity to meet other fellow language enthusiasts from all backgrounds and nationalities. Located an average of 20 minutes’ travel from the school, apartments generally accommodate 4 – 6 students who share kitchen and bathroom facilities. This type of lodging is offered on self-catering basis, allowing you to cook for yourself using local produce. A transfer service on arrival and/or departure can be arranged if needed in either Malaga or Gibraltar for an additional fee. Students should arrive in Marbella on the Sunday before their course starts and depart on the Saturday after their lessons finish. We may be able to arrange additional nights on arrival and/or departure to fit in with students’ flights. Average score for our school in Marbella based on 29 previous client reviews. I had great teachers/ Salvador and Isabel. The staff was very friendly and helpful. It took only two weeks to improve my level of Spanish, I wasn't expected to learn a new language so fast! Every lesson was different and there was always time to practice conversation. I'm satisfied with the course! I enjoyed the course and would like to repeat later this year. To be thrown in at the deep end is hard work but very beneficial for your learning. A fantastic course and college. The course is logically constructed and the college is able to place you in a class to suit your pace of learning. The course is thoroughly enjoyable with interesting and fun classes supported with relevant course material. I want to say a big thank you to the teachers who made one of my best learning experiences. The school accomodation was clean, close to the school and had good facilities. 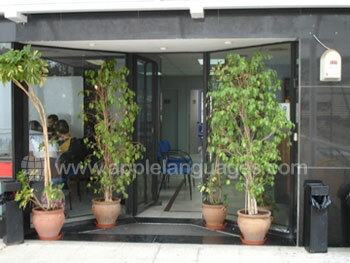 I enjoyed the course and will recommend Apple Language to friends who are interested in learning Spanish. Excellent - i really liked the fact that it was totally in spanish as this made us focus on picking up the language. Very good school. The course was Intense as expected with great teachers. Perfect, welcoming and fantastic hosts. Amaya and her daughter were wonderful, I'd defintely stay with them again in the future. My course was very enjoyable with excellent teaching, only 4 in class, well suited and level appropriate. The host family I stayed with was clean, comfortable, perfectly situated for school, seafront and town. Luisa the hostess very nice and keen to show me local life,talked in the evening and helped with conversation. The course was great! Plan to come back in June. Great teachers Anna and Raoul. Not only did I thoroughly enjoy every minute spent in the language school with some excellent teachers but I also learnt more in six weeks with them than I have learnt in 5 years studying at home. It was an unforgettable experience which will help me enormously in my daily life as a languages teacher. I was placed at exactly the right level to push me on with my language skills. Muchas gracias for sending me to such a great school! My accommodation was perfect and my host family was amazing. We became great friends whilst I was there and we are still in daily contact even though I've been home for six weeks. Everything that I learned in school I was able to practice with my host and her family and friends. She went out of her way to make my stay as memorable as possible. She was also a fantastic cook. I was extremely lucky to have had the opportunity to stay with her for 6 weeks. I would highly recommend Apple Languages to anyone wishing to study abroad. Every aspect of your service was perfect. Thank you so much! The course was really relaxed which was nice, as it didn't feel like we were in school. The teachers taught us what we wanted to learn instead of trying to force us to do things. They kept it interesting and enjoyable. My host was really welcoming and made us feel at home straight away. She was very fair and treated us like family. She was kind and considerate and always did her best to help us. The teaching was excellent: all were highly enthusiastic and very friendly. I felt comfortable practising my Spanish in that environment. The tutors were excellent; friendly and helpful. Overall, it was a great experience. 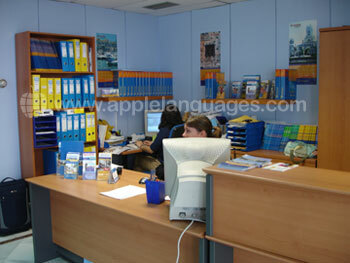 I shall be booking again with Apple Languages to continue my Spanish education in South America. As a first itme learning any language - this course was superb. It was very daunting at first but the teaching staff were patient, friendly and eager to help. Any course that I do which is so enjoyable I don't even realise I am learning has to be good in my book. The teachers were very patient and friendly. It was the most beautiful experience of my life, I met so many people and did so many amazing things in Marbella! I really would like to go back there next year. I enjoyed my week in Marbella and learned a lot of Spanish, met interesting, kind people - Spanish and English. A week wasn't long enough to gain fluency, of course, but I do feel I'm starting to think in Spanish, which is a start. The course was good and very interesting. My accomodation was brilliant, the host couple were helpful, interesting, accommodating, fun and made me feel very much at home which really was great as I was on my own for the first week. I would love to stay with them again. They were amazing. It was very efficiently run and the teachers were very friendly and helpful. There were only four in my group which was really good as it meant that you had to contribute a lot. I had been worried that I (at 53) would be with all young students, but fortunately in my group there was another lady of around my age. The house where I stayed was lovely - far better than I could have hoped. Spotlessly clean and very Spanish. My hostess was so attentive and considerate. One of the parts I most enjoyed was talking with her in the evenings. It was also just 10 minutes from the college. All in all my whole experience with Apple Languages has been totally positive. Apple Languages have always been friendly and helpful. Very friendly and competent teschers that inspired enthusiasm and interest in the classroom. I completed a week of spanish and flamenco in Marbella, and it was absolutely brilliant. The school was literally 5 mins from the beach, and on the first day they tested my level of spanish and then you were slotted into the correct ability level group. I was straight into classes the same day, and the flamenco! It was very well organised, and flamenco was virtually personal tuition with an excellent teacher. Totally funny and actually quite hard to dance! I fully recommend this course. 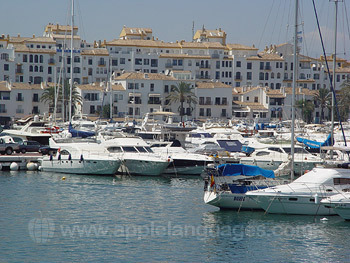 I stayed with a Spanish lady, literally 3 minutes from the old town, in a modern appartment in Marbella town. It was a great location and allowed me to come and go into the town in the evenings to meet other students. My host was very fun and animated, which was ideal as I constantly spoke spanish (well tried!) and she was very relaxed about when to cook for me in the evenings, and let me have keys so I could come and go as I pleased. It was a very good experience. I fully recommend the spanish and flamenco course. You get a real flavour of spanish culture, as well as challenge yourself by immersing yourself into a traditional dance. They also organised local tours to Puerto Banus, etc so you could get to know other students and get familiarised. Brilliant location near the beach and after lessons you just go and revise on the beach. Couldn't be better! In fact marvellous! I had a great time and the teachers were approachable and friendly. I had a fantastic time and really value the experience.